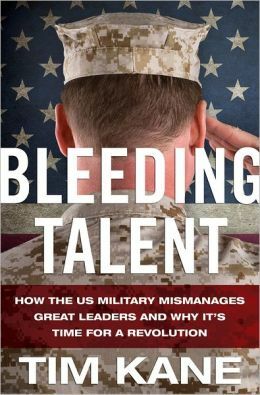 If anyone wants to attend my 90 minute speech & discussion about reforming U.S. military manpower, please feel welcome to attend the breakfast event tomorrow morning at the Army Navy Club in Washington, D.C. It is open to the public, so NOT, as I thought, a club members only deal. As a preview, I will suggest that the way to finally stand up to sexual predators in the ranks is NOT by taking away more authority from commanders, rather by giving them back control over promotions and hiring decisions. Registration/Breakfast – 7:30 a.m. | Program Starts – 8 a.m.
Are robots destroying the prospects of a vibrant future? Maybe. But the theory has a few holes. For starters, technology always kills jobs. American industry did not stumble upon innovation in 2007. The first ATM machine was installed in 1969, after all, and some of you may never have spoken to a live bank teller. Are today’s modernizations really more disruptive than those hatched during the first half of the 20th century or the Industrial Revolution? It seems unlikely that Facebook is a bigger game-changer than the mass production of the automobile. Congrats on a great start out the gate. 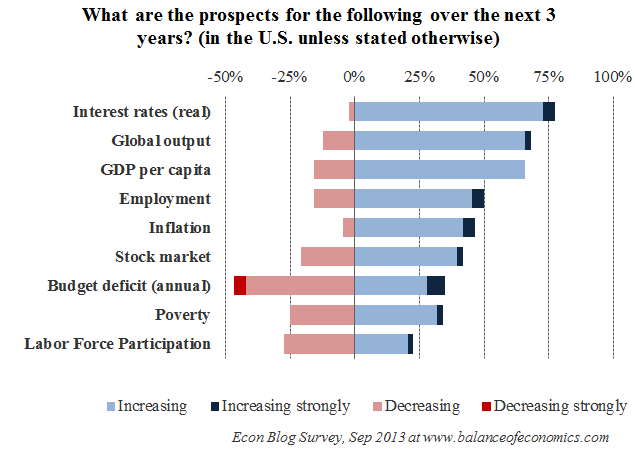 Here are some of the charts from the 2013 Survey of Leading Economics Bloggers that we just published at Hudson. Thanks to Genia Nizkorodov, one of my current interns, for help putting the final report together. So who can spot the trick question? For what it’s worth, Glenn has got me interested in Lincoln again, and is a big admirer of the 16th president. I am engrossed in Rich Lowry’s book and hope to review it soon. The Civil War sent federal spending skyrocketing from around $70 million to more than $1 billion in 1865. Again, however, war was followed by a long period of retrenchment, as federal spending was held constant and the debt was paid down. Spending was roughly flat at about $300 million for two decades, 1870 to 1890. The budget was balanced every year from 1866 to 1893. That’s from Chris Edwards at CATO, one of the reliably insightful and reasonable budget experts in Washington. Read Chris’s whole essay at National Review. 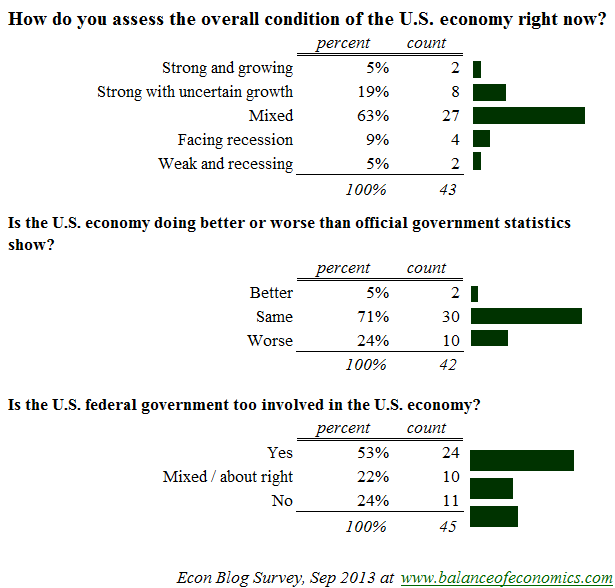 Here is a preview of the Econ Blog Survey for September 2013. This continues a survey I began over three years ago when Bob Litan and I started the growthology.org blog at the Kauffman Foundation. I will put together a report discussing the full results in a day or two, but thought these results were worth previewing. One of the questions was submitted by Bob Litan, and a related (uncoordinated) question was submitted by Donald Marron. 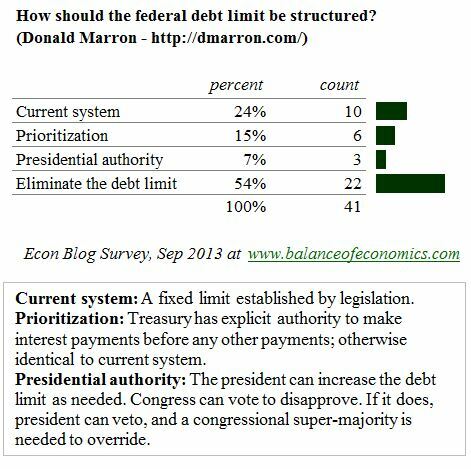 Marron’s question reveals a strong preference among economics bloggers to eliminate the debt ceiling. 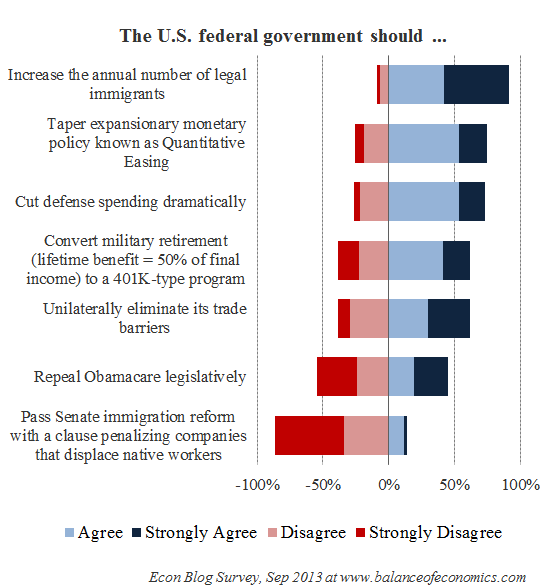 I’ll confess that I disagree with the majority on this one. 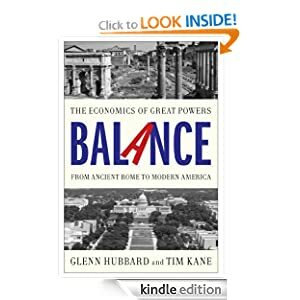 While I favor neither presidential absolutism or the current system, that’s because I see the layered authority of Congress not as something ridiculous (as the administration spins it), but as a long-lived and well-designed check and balance on the power of the purse. Of course the executive prefers a power grab from legislators, but they would be foolish to remove this check on debt. It’s about the last meaningful dam on debt America still has. 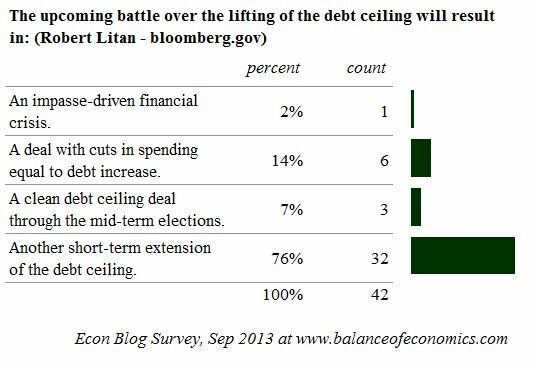 Prioritization is one improvement, but I disagree that the debt limit itself is the source of our fiscal problems. More interesting results coming soon.